Who are the Master data management improvement team members, including Management Leads and Coaches? Will Master data management deliverables need to be tested and, if so, by whom? Will team members regularly document their Master data management work? What situation(s) led to this Master data management Self Assessment? Who will be responsible for making the decisions to include or exclude requested changes once Master data management is underway? This book is for managers, advisors, consultants, specialists, professionals and anyone interested in Master data management assessment. Featuring 371 new and updated case-based questions, organized into seven core areas of process design, this Self-Assessment will help you identify areas in which Master data management improvements can be made. Using a Self-Assessment tool known as the Master data management Index, you will develop a clear picture of which Master data management areas need attention. 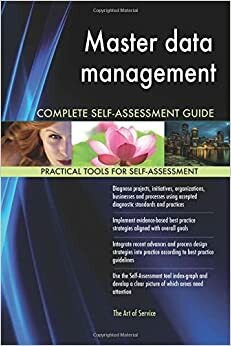 Included with your purchase of the book is the Master data management Self-Assessment downloadable resource, containing all questions and Self-Assessment areas of this book. This enables ease of (re-)use and enables you to import the questions in your preferred management tool. Access instructions can be found in the book.